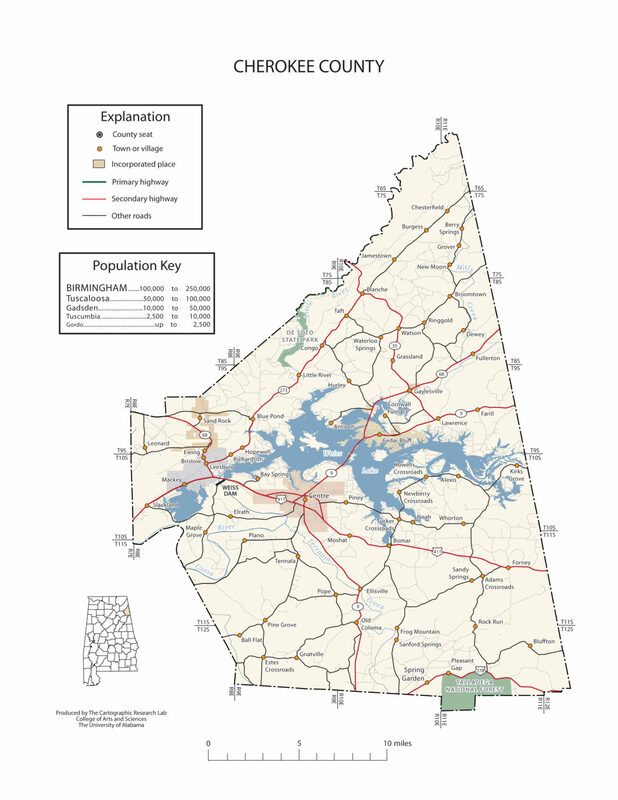 Cherokee County, Alabama population is 25,989. Its county seat is Centre, Alabama. The county is named for the Cherokee Indian tribe.The area included in today’s Cherokee County for centuries had belonged to the Cherokee Nation of Native Americans. On December 29, 1835, however, Cherokee leaders signed the controversial Treaty of New Echota, agreeing to surrender their lands in return for new lands west of the Mississippi River. Cherokee County is home to Weiss Lake and Little River Canyon. The area included in today’s Cherokee County for centuries had belonged to the Cherokee Nation of Native Americans. On December 29, 1835, however, Cherokee leaders signed the controversial Treaty of New Echota, agreeing to surrender their lands in return for new lands west of the Mississippi River. This treaty contributed to the apparent theft of land from the Native Americans by the U.S. government. To this day, there are few Native Americans in Cherokee County. 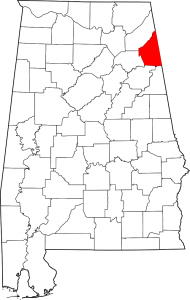 Centre, Alabama is the county seat of Cherokee County. Known as The Crappie Capital of the World, Weiss Lake hosts many local, state, and national fishing tournaments. Waters flowing from the Coosa, Little and Chattooga Rivers converge to form one of the largest freshwater lakes east of the Mississippi River and, consequently, is the central attraction for Cedar Bluff tourists, vacationers, and retirees alike. The brilliant sunset colors dance above the calm waters of Weiss Lake, upon the banks of which rests the town of Cedar Bluff. Constructed in the early 1960’s to serve as a reservoir for hydro-electric power generation, the lake occupies over 30,200 acres and has nearly 450 miles of shoreline. It is surrounded by forest-covered mountains, an array of beaches, and natural scenic views. Many enjoy touring the area by boat, while others appreciate the ideal sporting and fishing conditions. Founded in the mid 1800’s by Alfred Collins and surrounded by the beautiful Appalachian Mountains of northeast Alabama, Collinsville is a great place to call home. With a current population of 1995,Collinsville has excellent schools and churches, a wonderful old southern culture, property available for new business and industry, and a Municipal Government that is committed to improving an already great town. Your visit to Collinsville will almost certainly include a drive down shady streets lined with great old homes, a taste of southern ‘home cooking’ at one of the unique restaurants, and a friendliness seldom experienced this day and time. Or, maybe a visit to one of the south’s oldest and largest flea markets will be the highlight of your stay – Collinsville Trade Day is held every Saturday, rain or shine, and is located at the south end of town on U.S. Highway 11. Whether you come to town for a day or for a lifetime, you’ll be welcome in Collinsville. The area was settled in the early 1830s, just before the removal of the Cherokee Indians. It was known originally as Sulphur Springs and was an agricultural center for cotton, corn, and hay. Nearby deposits of iron ore were mined and used to produce iron at the Cornwall blast furnace, located between Gaylesville and Cedar Bluff; the iron later was used by the Confederacy during the Civil War. If you live in the Town of Leesburg, AL, you already understand all of the great things our town has to offer — from lakeside living and breathtaking mountains to the benefits of small town life. If you are planning a visit to Leesburg, you can experience all of these things too. What better outdoor vacation could you plan than relaxing on Lake Weiss, catching our world-famous crappie? Or you could be enjoying spectacular views at the Little River Canyon National Preserve, Cherokee Rock Village, or Yellow Creek Falls. Live here or just visit — we hope you enjoy every moment. Sand Rock is located in western Cherokee County atop Lookout Mountain. A portion of the town extends north into DeKalb County. We are pleased to welcome you to the mountaintop town of Sand Rock, Alabama, situated in the Northwestern part of Cherokee County. Sand Rock has that “hometown America” atmosphere with all the character and friendliness you’d expect from a close-knit hospitable community. The Sand Rock community has a rich history dating back to the early 1800s. It is a small town of about 500 residents located in northeast Alabama. Rich in hospitality, natural beauty, and strong family and faith traditions, Sand Rock values its rich rural heritage, strong school and community support, and strong work ethic. This site has been studied for years by the history and archaeology departments of the University of Alabama. The site lies just southwest of Broomtown in the community of “Possum Hollow” and just NE of Gaylesville, Alabama. The site is rich in Indian history. There was once a village along the creek in this area. Thousands of arrowpoints, spear points, pottery shards, beads, and even the dwelling remains have been studied.